Made of stylish polished metal, these handsome Poker Chip Sets are ready for play with two decks of playing Cards. You can choose from a variety of unique, top-quality sets, including our Kem Poker Set and the Official World Poker Tour Set, each equipped with durable All-Plastic Playing Cards and Heavy Weight chips for a casino look and feel. 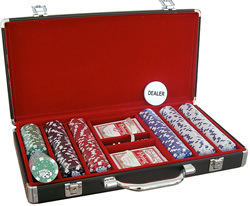 This Kem Poker Set features a sturdy aluminum case, 11.5 gram "Dice" poker chips, and two decks of kem cards. The shell of the case is made of handsome polished aluminum, and the carry handle and locking hardware have stainless steel construction. 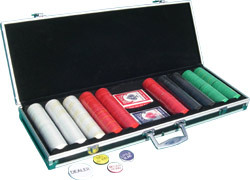 Card and chip trays are covered with a velour style material to protect your set. Thick foam padding on the inside of the lid holds your contents firmly in place during transportation. Our 300 capacity chip case features 100 white, 100 red, 50 blue, and 50 green chips. Kem cards are available in Red and Blue or Green and Brown. Each deck measures 2-1/4" wide by 3-1/2" tall. Case sets are also available without cards. Our 500 capacity chip case features 150 white, 150 red, 100 blue, 50 green, and 50 black chips. Kem cards are available in Red and Blue or Green and Brown. Each deck measures 2-1/4" wide by 3-1/2" tall. Case sets are also available without cards. *The 300 chip set contains 100 white, 100 red, 50 green, and 50 black chips. 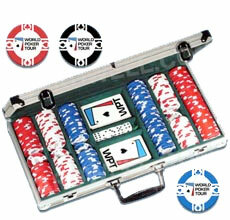 This stylish, 400-Count Poker Chip Set has everything you need for your next poker game! Sale - $49.22. Was $59.00. Save 20%! Sale - $46.61. Compare to similar Black Case Sets at over $100!